I have been looking mainly at the cakes, but have always fallen short – mainly because I have no circular cake tins!! This is something that has to be rectified soon but since the weather was so bad this weekend in Edinburgh I decided not to risk the extra trip out to find me some 9″ cake tins. Thankfully I do have a square cake tin so many of the recipes in the book were still open to me. 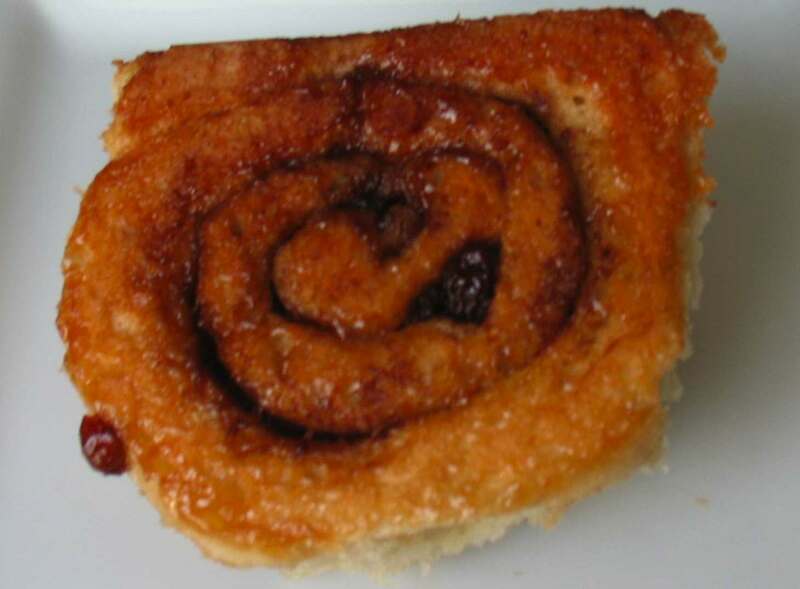 Eventually I decided on Cinnamon Buns as it would be a wonderful Sunday morning treat, the fiancee really loves Cinnamon and cooking bread from scratch was totally new to me. In the past the thought of using dried yeast scared me, I don’t remember when or where the feelings came from, but I was sure doing it from scratch was fraught with dangers, that my bread wouldn’t rise, that it wouldn’t hold together, that I was in all probability heading to my second major all out kitchen disaster (the first being the eponymous Coffee Muffins). With only one false start my Cinnamon Buns turned out amazingly fluffy and light, while I was a little bit disappointed in the cinnamon-i-ness of the bread, it did taste very very good. It is a fairly drawn out process, you need to start the night before you wish to eat your buns and leave them 12 hours in the fridge overnight. 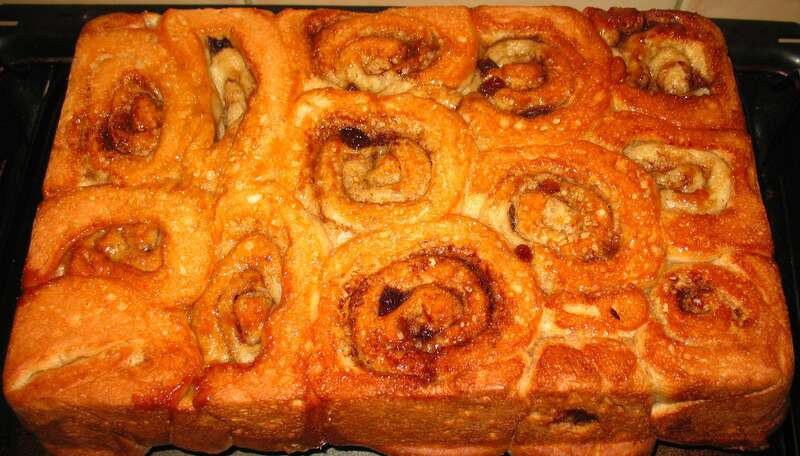 This recipe as mentioned above comes from Good Housekeeping: Great Baking the only changes I have made was the replacement of coconut oil instead of butter (using the 3/4 rule) and that next time I would add at least 2 tsps of cinnamon to the dough mixture. 560 grams of all-purpose flour (although I used strong white bread flour, as I had already used up all my normal flour). In a cup add the warm water, the yeast and 1 teaspoon of granulated sugar, stir and leave to go foamy – should take around 5 minutes. This stage didn’t quite go to plan the first time as after 5 minutes I had got precisely 1 bubble forming on the surface, as the whole point of yeast seems to be to create bubbles, I knew this wasn’t quite what I was looking for. However I tried again with slightly colder water (the previous batch had come from a fairly recently boiled kettle) and while the result wasn’t quite as spectacular as I had imagined there was definitely a thin skim of foam on top of the liquid and I carried on. With a mixer on at low speed blend yeast mixture, milk, butter (or coconut oil), egg yolks and the first 440 grams of flour. Then add your 48 grams of sugar and continue until blended. With wooden spoon blend in a further 105 grams of flour (you should have around 35 grams left). At this point it should start forming a dough. Lightly flour your work surface and begin to knead the bread, for around 5 minutes, re-flouring the surface when necessary to stop the dough from sticking, this will approximately take the last 35 grams of flour, but could be more. Place your dough into a greased bowl, cover and leave for 1 hour in a warm place. 38 grams of dried currants, I used sultanas as I find the taste less harsh and they plump up better. 4 tablespoons of melted butter (I actually used butter this time as I had just this amount lying around, but again 3 tablespoons of melted coconut oil should be perfect). MIx the sugar, sultanas and cinnamon together throughly, don’t add the butter. 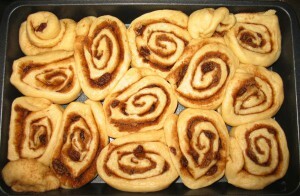 Cinnamon Buns in tray before they go into the fridge. After the dough has been left to rise for an hour, punch it down. This part is really quite enjoyable I gave it a couple of really good punches! On a lightly floured worksurface roll out the dough to be around 18″ by 12″ and rectangular. Brush the entire area of the dough with your melted butter, and then sprinkle with the filling mixture. I am not sure sprinkle is the correct adjective here – I poured it on – making sure not to put the mixture all the way up to the edges. Slice your roll into around 20 slices, placing them cut side down in a 13″ by 9″ square tin. Cover the tin with clingfilm and place in the fridge for around 12 hours. 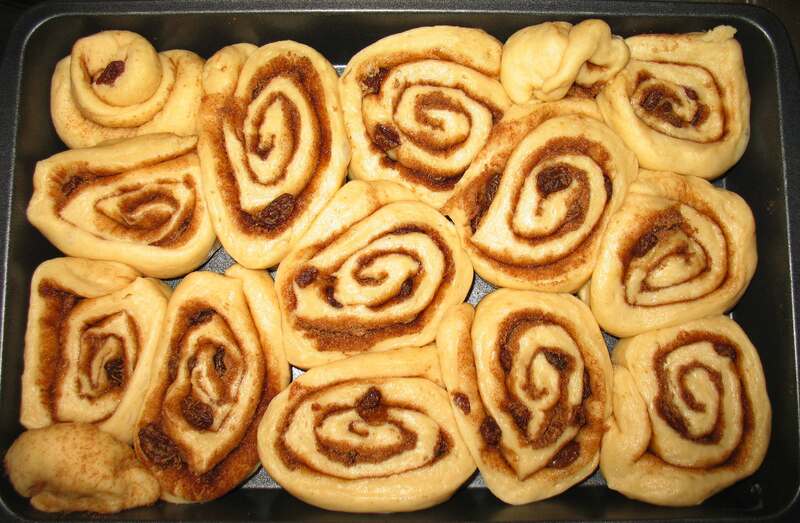 The next morning preheat the oven to 190 Celsius and bake your buns for around 30 minutes. Once you take out from the oven immediately remove from tin, this is easiest done by putting a baking sheet on top of the tin, and then flipping, so the buns are now on top of the baking sheet. Cinnamon Buns straight from over, yum! I had number of these buns the morning I made them (Sunday) and then had one warmed up in the evening with plain vanilla ice-cream which was beautiful. I put around half of my buns in the freezer, supposedly 15-20 minutes in a preheated oven of 180 will do the trick to reheat them.